TemplateHack.com - Download Lunafy Dark premium blogger template. 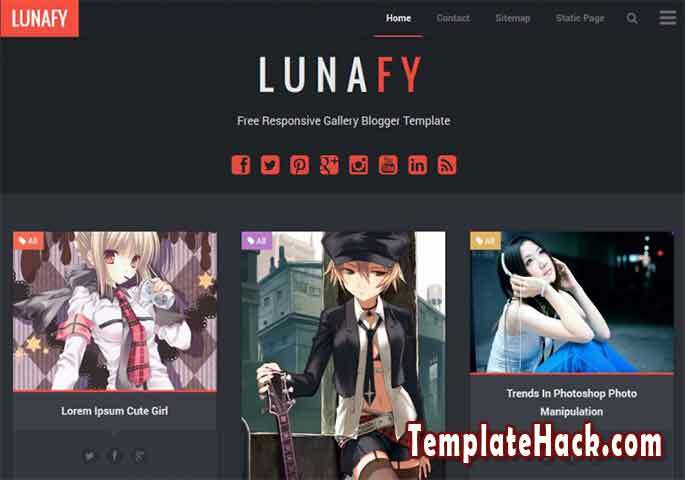 Lunafy Dark is anime blogger template made with black and red base color. It will help you to make high quality blog with high quality recommended template. Lunafy Dark is free premium version blogspot template. Applied on your blog and get the best features inside this amazing template. One of the best featured inside this template is social share button. You can share your every blog post to social media such as Facebook, Twitter or WhatsApp easily. About Me, Breadcrumbs, Browser Compatibility, Fast Loading, HTML5 Valid, Mobile Friendly, Page Navigation Menu, Post Thumbnails, Responsive, Search Box Button, Social Bookmark Ready, Social Share Button, Stylish, Whatsapp Sharing Button, Elegant, Unique, No Sidebar, Black, Red, 3 Columns, 3 Columns Footer. Anime blogger template, Entertainment blogger template, Gadget blogger template, Gallery blogger template, Magazine blogger template, Movie blogger template, Personal blogger template, Pinterest Look blogger template, Photo blogger template, Photography blogger template, Reviews blogger template, Viral blogger template, Video blogger template, Tutorial blogger template, Design blogger template, Internet blogger template, Art blogger template.